The final four teams are set and this Sunday will determine the two teams heading to Atlanta for Super Bowl LIII. Here's a preview of the NFC Conference Championship Game between the Rams and the Saints. During the 2018 regular season, the Chiefs led the NFL with a scoring average of 35.3 points per game, followed by the Rams (32.9), Saints (31.5) and Patriots (27.3). This Sunday will mark the first time in the Super Bowl era in which the four highest scoring teams in the regular season all advanced to the Conference Championships. However, in the Divisional round, defense loomed large as each of the four remaining teams came up with big defensive plays on their way to victory. In the NFC Divisional Playoffs, New Orleans Saints cornerback Marshon Lattimore had two interceptions, including the game-sealing pick in the fourth quarter, while the Rams defense came up with a fourth-down stop in their own territory to begin the fourth quarter against Dallas that led to the eventual game-winning touchdown. The NFC Conference Championship game features a rematch of a memorable 2018 regular season game and are highlighted by their star quarterbacks, as the matchup includes an all-time great against an outstanding young star. In New Orleans, Saints quarterback DREW BREES, the NFL's all-time leading passer, faces off against Rams third-year quarterback JARED GOFF. 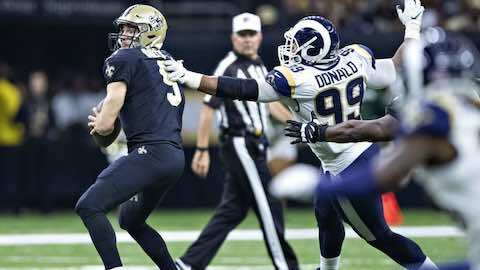 In their Week 9 meeting, a 45-35 win by New Orleans, Brees passed for 346 yards and four touchdowns while Goff totaled 391 passing yards and three touchdowns. The Rams and Saints meet in the postseason for the second time. In the two teams' only postseason meeting, the Saints defeated the Rams 31-28 in the 2000 NFC Wild Card Playoffs (December 30, 2000). The Rams hold a 41-34 advantage in 75 all-time meetings between the clubs (including the postseason). The teams last played in Week 9 (November 4), with the Saints winning 45-35. The Rams have advanced to the NFC Championship Game for the tenth time in franchise history. The Rams' most recent NFC Championship Game appearance was in 2001 against Philadelphia (January 27, 2002). Rams running backs C.J. ANDERSON (123 rushing yards, two touchdowns) and TODD GURLEY (115 rushing yards, one touchdown) each eclipsed 100 rushing yards in the Divisional Playoffs, becoming the first duo of running back teammates to each rush for at least 100 yards in a playoff game since the 1997 Wild Card Round (Denver running backs TERRELL DAVIS and DEREK LOVILLE vs. Jacksonville, December 27, 1997). Gurley leads the NFL with 22 scrimmage touchdowns and 18 rushing scores this season (including the playoffs). The Rams, who led the NFC in total offense in the regular season, recorded 459 net yards of offense in the Divisional Round, a franchise postseason record. Los Angeles' 273 rushing yards in the Divisional Round also marked a postseason franchise record. Los Angeles won the NFC West for the second consecutive season and the team's 13 wins are the most for the franchise since 2001, when the team won the NFC and advanced to Super Bowl XXXVI. The Rams had four players selected to the 2019 Pro Bowl: defensive tackle AARON DONALD, quarterback JARED GOFF, running back TODD GURLEY and special teamer CORY LITTLETON. This is the Saints 3rd NFC Championship Game in their 52-season franchise history. New Orleans previously played in the NFC Championship Game in 2009 (January 24, 2010) and 2006 (January 21, 2007). New Orleans wide receiver MICHAEL THOMAS caught 12 passes for 171 yards in the Divisional Round. His 171 receiving yards were a single-game franchise postseason record. Saints quarterback DREW BREES threw for 301 yards last week and holds the NFL record for the most 300-yard passing games, including the postseason (123 games). New Orleans captured the NFC South for the second consecutive season, the first time in franchise history they have won back-to-back division titles, and earned a first-round bye for the first time since 2009. The team's 13 regular-season wins match a franchise record and are the most since 2011. The Saints had five players selected to the 2019 Pro Bowl: tackle TERRON ARMSTEAD, quarterback DREW BREES, defensive end CAMERON JORDAN, wide receiver MICHAEL THOMAS and center MAX UNGER. Last week my prediction didn't pan out as the Saints defeated the Eagles 20-14. This week, I'm picking the Saints because I think they'll come out swinging and not put themselves into a 14-point hole. The game will be closs and the outcome will hang in the balance, but I don't think it's going to be a high-scoring affair as was the Week 9 outcome between the two earlier this season. "We think it's a tremendous advantage to play here. Our fans were fantastic tonight. Communication becomes difficult. We've been on both sides of it. We've played in some tough road venues where it's real loud. Minnesota, Seattle, and we play at home here. That's one of the reasons why you fight so hard for the best seed you can. So that you have the chance to play with the noise in your favor. We have a lot of work to do. You get a really good team we beat to day. A great championship team. You can't say enough about them." I wouldn't be surprised if the Rams win, but the only way I see it happening is if either Drew Brees has a subpar performance or one of Sean Peyton's calculated risks backfires on the Saints. I just don't envision Drew Brees being less than spectacular. Two takeaways and a fake punt against the Eagles may have been the difference last week, but I don't expect the Rams to fall victim to turnovers and fake punts. Despite a furious second half rally by the Rams, where they came back from an 18-point halftime deficit and tied the score at 35 apiece early in the fourth quarter, the Saints scored the last ten points as they improved to 7-1. The Saints took charge from the start in the contest when on their first offensive drive they marched down the field in ten plays, ending with a 11-yard TD by RB Alvin Kamara. The Rams quickly struck back when RB Todd Gurley rushed for an eight-yard TD. The Saints answered when QB Drew Brees found Kamara for a 16-yard TD on a screen. Los Angeles knotted the score back up at the start of the second quarter when QB Jared Goff found wide WR Brandin Cooks for a four-yard touchdown. On the next play from scrimmage, RB Mark Ingram lost a fumble, but the Saints defense and special teams backed the runner up when on a fourth down fake field goal attempt, LB Craig Robertson stopped H Johnny Hekker short of the first down marker. The Saints then scored 21 unanswered points in the second quarter to take a 35-17 halftime lead as they set an NFL record with 24 first half, first downs. Goff led a furious second half rally, engineering drives for two touchdowns and one field goal to tie the score. However Brees found WR Michael Thomas for an 18-yard third down completion to set up a field goal and on New Orleans' next drive, the duo connected on a 72-yard TD. The Saints outgained the Rams 487-483, but New Orleans scoring a touchdown following an interception in the first half and forcing the first three-and-out of the contest in the fourth quarter made for the slim difference. NFL Football: "NFC Conference Championship Rams vs Saints Preview - 2019"